Are you searching for sweeper hire in Barnsley? If so you’ve come to the right place! With more than 40 years industry experience and expertise, Go Plant Fleet Services are leading providers of sweeper hire countrywide, working with many clients in the Barnsley area. Since day one we have been dedicated to providing an exceptional level of customer satisfaction – we take great pride in working with our clients to create a tailor-made sweeper hire package which suits the specific needs of your business perfectly. We understand that each project is different, so we offer a comprehensive selection of different vehicles for you to choose from dependant on the type and scale of project. Take a look at some of our options below to make your decision easier. Our first option is our large sweeper hire, this consists of our 7.5T and 15-18T truck mounted sweepers. Both models are designed specifically for heavy use and are often used by highway agencies and construction companies to complete large scale projects. If you require something smaller, perhaps for every day street cleaning, we also offer pedestrian sweepers. Compact, lightweight, and featuring a small chassis, our pedestrian sweepers are perfect for areas which are restricted in terms of space and access, or for where there are pedestrians present. For an ultimate deep clean, we also offer Back to Black Beam Sweepers. With high pressure water systems and a high specification configuration, our back to black sweepers are the perfect choice for reconditioning heavily soiled surfaces or for cleaning new roads. To meet the needs of all our customers, we also offer both self-drive sweeper hire and operated sweeper hire in Barnsley. Should you choose our operated vehicle hire, you will benefit from the services of our skilled team of operators who all hold CSCS and epic plant operator certificates. 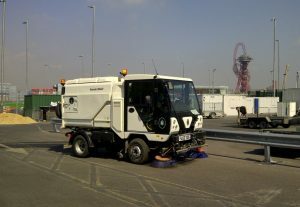 Operated sweeper hire is a popular choice for many large businesses, as it reduces the need to hire and train extra staff to complete the work. Regardless of you project scale or type, Go Plant Fleet Services can provide you with efficient, reliable, and cost-effective sweeper hire in Barnsley. All our vehicles are maintained to the highest standards to ensure that they perform perfectly during the hire period and we also offer both short and long-term contracts. If you would like to find out more please get in touch with a member of our team.